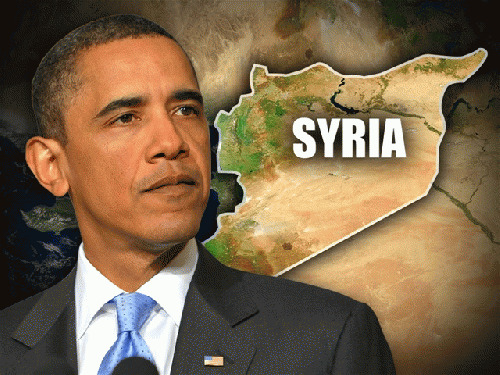 The U.S. Secretary of State John Kerry on this August 26 removed the sword of the alleged Syrian chemical weapons from its sheath and let the snow ball of this subterfuge for a military aggression on Syria roll unchecked, raising the stakes from asking whether "it will happen" to "when" it will happen, promising that President Barak Obama "will be making an informed decision about how" to take on Syria and warning not to make a "mistake" because Obama "believes there must be accountability," making clear that a U.S. -- led military action is in the making and imminent. independent commission of inquiry, headed by UN High Representative for Disarmament Affairs, Angela Kane, and led by the Swedish scientist and the veteran "inspector" for the UNSCOM and UNMOVIC inspection regimes in Iraq , Ake Sellstrom, arrived in Damascus on August 24 for a fourteen - day mission to investigate whether or not chemical weapons were used in Syria. The fact that this UN mission is in Syria in response to an official request sent by the Syrian government to the UN Security Council on March 19, 2013 to investigate the first chemical attack, which was launched then from the positions of the U.S. -- sponsored armed gangs fighting the Syrian regime on the government -- held northern town of Khan al_A'ssal, as well as the fact that the U.S. for five months opposed such an investigation unless the UN adopts it as an "inspection" mission all over Syria, are self -- evident enough facts to leave no doubt about the real intentions of the United States. The timing of the reported chemical attack in the eastern suburbs of the Syrian capital on August 21 coincided first with the arrival of the UN investigators in Damascus and second with launching what the Syrian Arab Army (SAA) codenamed the "Reinforcement of the Shield of the Capital" (RSC) military operation to root out the armed gangs operating in the same area, consisting of al-Qaeda -- linked Islamists, but mainly of the Jabhat al-Nusra, which the U.S. listed as a terrorist organization last December. In view of the progress of the RSC operation, following a series of other successful operations by the SAA since their strategic breakthrough in al-Qusayr in June this year, which sealed off the borders with Lebanon through which rebels used to infiltrate, it was noteworthy that the American, French, British and German leaders as well as their Turkish, Qatari and Saudi Arabian allies demanded an immediate "ceasefire," allegedly to allow and facilitate the mission of the UN investigators; alternatively, if the RSC operation did not stop, the Syrian government was accused by them of "systematically" destroying the evidence. The Syrian foreign minister Walid al-Muallem in his press conference in Damascus on Tuesday reiterated what his government had previously confirmed: The RSC operation will continue. The U.S. -- led threats of an imminent military action was the only option left for the western backers of the rebels in Syria; their declared goal is to stem the accelerating successes of the SAA and to return the balance of power to the status quo ante.